A sculpture of a Celtic sea-god stolen in 2015 by apparent Christian extremists is to make a reappearance at a music and arts festival this weekend. The stolen sculpture of the mythic sea-god, Manannán Mac Lir, is to feature at the Stendhal Festival, due to begin just outside Limavady on Friday. The sculpture itself was originally erected at a picturesque location above the cliffs of Binevenagh in Co Londonderry by the old Limavady Borough Council as part of a ‘myths and legends’ sculpture trail. It was cut from its base in January 2015 and replaced with a small wooden cross bearing the words of the fifth commandment – you shall have no other gods before me. The mystery overnight disappearance of the beautiful sculpture and the apparent religious motivation for the act of vandalism sparked headlines around the world and, eventually, the sculpture turned up. A group of ramblers making their way through the rugged cliffs at Binevenagh just two months later happened upon the badly damaged work of art and, thanks to the help of nearby Royal Irish Regiment soldiers, the artwork was recovered. Deemed by the council to have been too badly damaged to be repaired and returned to the top of Binevenagh, a replica was commissioned from the original artist, Darren Sutton. However, it is the stolen original – after some repairs – that is to feature at this year’s Stendhal Festival. 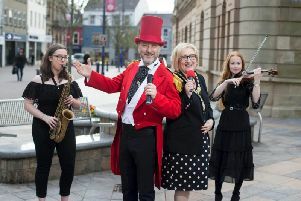 Festival director Ross Parkhill told the News Letter: “We were really just chancing our arm after we heard that a bit of restoration work had been undertaken on the original piece. To our delight the council agreed to let us show him off. Mr Parkhill joked that he had heard “a few comments suggesting we were the culprits of the theft”. He added: “We can assure you though that it wasn’t us. The sculpture will be on display at the ‘Woodtown’ section of the festival. Headlining the musical proceedings this weekend will be the Mercury music prize nominees, the Magic Numbers, and Northern Ireland band Ash. David O’Doherty tops the comedy bill.